Tutorial - How to Install Android 6.0 Marshmallow Operating System on your PC using Virtual Box/ VMware workstation. In previews post We talk about Install Android x86 6.0 Marshmallow on PC with Windows, Linux, MAC Dual Boot Supported. Step 1. Download Android 6.0 x86 ISO and Virtual Box file from end of post link given. Once you downloaded the both file, run Virtual box and install it on your PC. When it asked to install a new network adapter Just select Install button. Once the installation is complete Run Virtual Box on your PC. Now You needed to create a new virtual machine for installation of Android. Just Click on NEW button. Give a new name to the virtual machine whatever you want. In next step just select Type as Linux and Version As other Linux 32-Bit. Click on Next button Now Enter RAM size 512 (Recommended) or whatever you want. Again Click Next button then Create a virtual hard disk as VDI Virtualbox disk image then select Dynamically allocated and Enter size of disk image (Use 5 GB for disk space Recommended). Select virtual machine and Click the Settings button from upper left corner. Click the Storage option and then click the Empty entry in the Storage section. Now From the right, click the disc button and select Choose a virtual optical disk file option and Navigate to the Android 6.0 ISO file you have downloaded, select it and click Open then press OK button to save the settings. Now it's time to install Android on your Virtual Box. Step 1. Click on START Button to start virtual machine. Step 2. 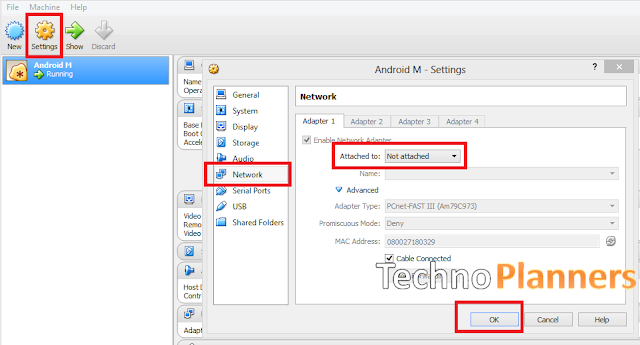 Select Installation - Install Android to hard disk option using your keyboard. Step 3. Now you needed to create a fresh partition to install Android. Just Select Create modify partition and hit on Enter button. Select New from the bottom using Left/Right button from keyboard and press Enter. Select Primary and press the Enter button. Select the booltable option and press Enter. Now select Write from the bottom and press Enter, and then type YES before press Enter. Select Quit, and select the partition you’ve just created and press Enter. Step 4. Now select ext3 and press Enter. Then select YES to format the partition. Step 5. Now, It will ask for installation for Grub Bootloader. Just select YES. Step 6. Now, another prompt message will ask you to make system directory as read and write. Select YES and press enter. It can not take more than 1 minute. Step 7. Now it show Android-x86 is installed successfully. Now you needed to remove the virtual optical disk device (CD/DVD device). From the upper left corner, Select Devices then Optical devices. Now Select Remove disk from virtual device. You have to disconnect network connection from Virtual Box. Go To Settings in Virtual Box. Select Not Attached option from Attached to. Congratulations, Now you can use Android 6.0 Marshmallow on your PC with Virtualbox. You can install virtual box on Microsoft windows and Linux operating system and easy use that amazing software. Share this Tutorial with your friends and family. So it asks for internet and i can not continue. Network settings set to "not attached". if you enable network settings again and tried 'Browser' it stops.. i encountered 'Google Play Services stopped' error when adding a google account.. I get a black console... I don't know what I did wrong? how to enable network settings again and tried 'Browser' it stops.. i encountered 'Google Play Services stopped'but you tube video played & no camera apps show any other apps say unfortunately Google Play services has stopped. please help me. I keep getting a console whenever I boot Android up. What do I do? So why Android is installed on my PC but can not be connected to the Internet? Android without internet??? How To Install Android 6.0 Marshmallow On VirtualBox ?